Straight from China - and worth every penny. FINALLY finished mounting the spot/flood combo bar - purchased a month ago. I had to have the light tabs on my bumper moved because of the bulk of the bar + brackets. Nevertheless, I am beyond happy with the purchase - came complete with wiring harness. True plug and play. Despite the yellow tint you see in the 'off' pic (where you can see how I moved the brackets from atop the cross bar, to mid-bar), that's probably a reflect from my phone's flash. No yellow/amber when viewed normally. The bar is advertised at 10k lumens, however I have no way to measure. What I can see, however, is subjectively the light could be 10x brighter than my headlamp bulbs, which are likely about 800 lumens. 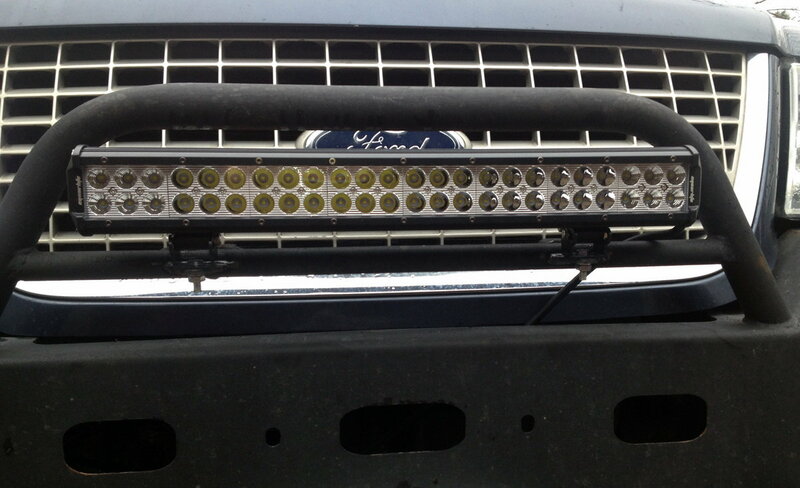 The bumper lights have 85W Hella - amber - in diffused/fog-patter glass lenses and metal housings. LED headlamp bulbs to follow. 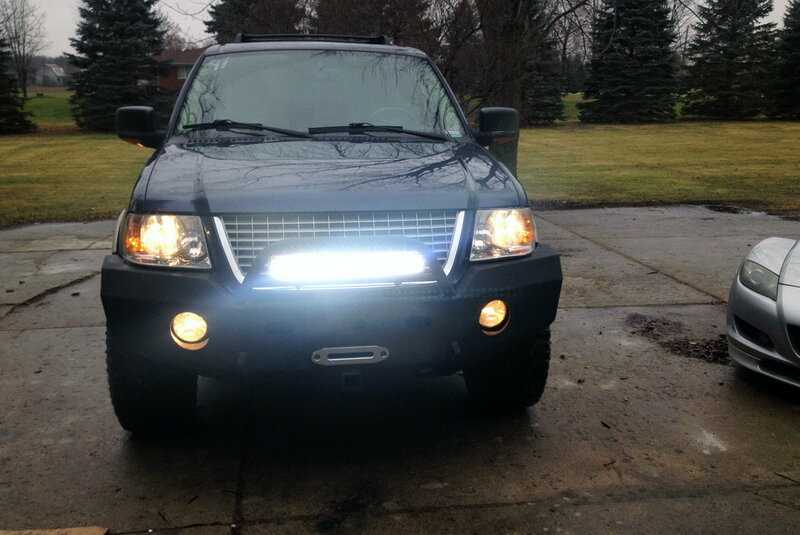 Right side: Bright headlights ON + LED Bar. I will adjust the LED bar to aim a little bit upwards; the biggest bright spot is too far down. Save yer money - it's all 110% BS marketing, zero regard for optics and junk science & terminology-based obfuscation. Yer existing housings are totally unsuitable as well - halogen-based reflector. Save up fer a proper HID projector retrofit, or get some new clear-lensed housings and fresh halogen bulbs. I'll keep talking with http://www.olympusoffroad.com/ - and their LED headlights before I make the call. I installed led fog light bulbs in my truck took them out and put the stock ones back in. Terrible light. I corrected my post - had another look at yer heads - clear lenses. not fluted. But - still a halogen-only reflector. To-date there is no one who produces a LED emitter that can emulate a halogen light source to the required degree of positional precision ( fractions of a millimeter ) or source orientation. This renders the reflector purdy much useless for beam control. Anyone who tells you different is being disingenuous (fayncy werd fer lyin'). The experts on HIDplanet effectively say it all ( Markus, Mick, Satrya, Kozera, etc. ). Even TRS has not released due to the challenges; after much exploratory effort they've shelved it. There is a lengthy thread discussing same. Olympus peddles the same poorly designed Chinglish crap as all the other variants, sorry to say. 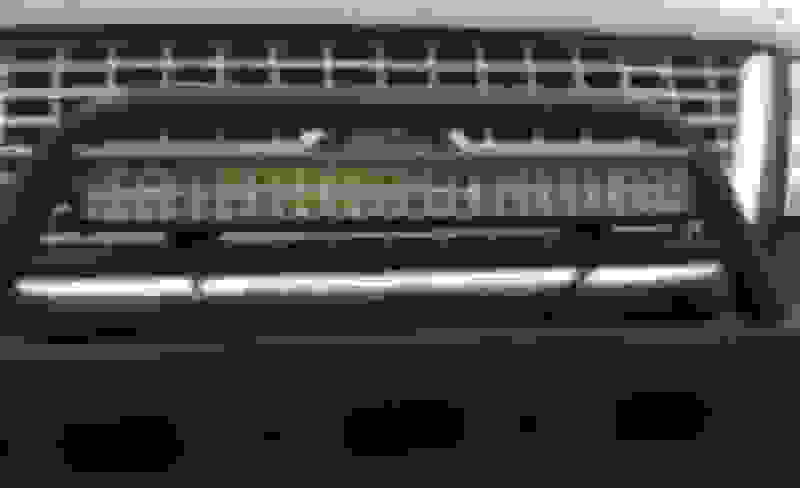 http://olympusoffroad.3dcartstores.c...ghts_c_75.html. Just tryin' to save you some heartache, bud. Please don't shoot the messenger.... I've been looking at this sort of stuff for a loooong time. Even bought an early variant to play with. Makes a good work light - will never see the light of day in a vehicle headlight, lol. Thankee, sir .. and very best o' luck on ye retrofit! Just ordered Narva Range Power +50 low beams in hopes of tiding me over until I have a better solution. Stock headlamps are around 1200lm low beam, 1900lm high beam. That last picture highlights the problem with LEDs- they are directional light sources and you cannot effectively utilize a LED light with optics designed for a completely different light source. 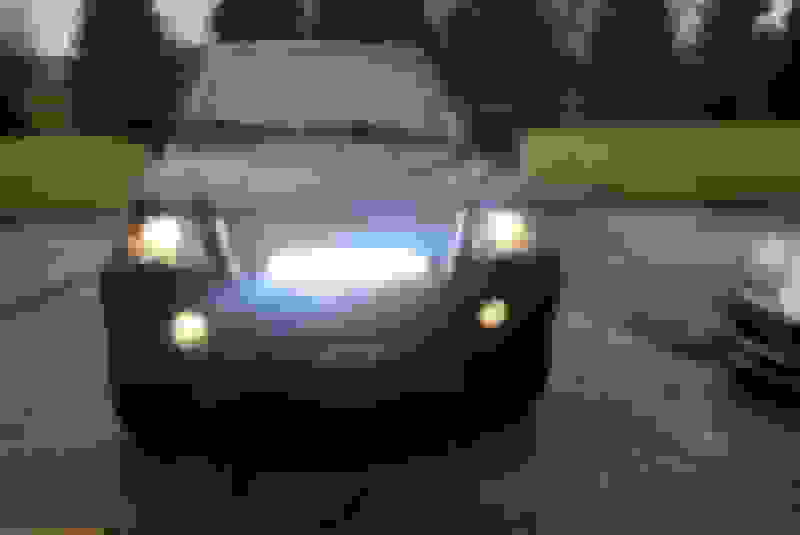 "How do i adjust my headlights down? I havent gotten highbeam checked yet but I DID have 2 different cars I was in front of move there rear view window and another tap his brakes a few times ( i was up his *** kinda). I can see into the inside of peoples cars with these so I do need to adjust them. But other then that i really like them. But the high beams are useless and its annoying not having highs, when i hit the highs the light doesnt change except theres extra light at the bottom of the front bumper (like how fog lights light up the ground)"
And I guarantee they won't last. HIDs will last about 2,000 hours. And I can confirm that because I drive 100 miles every night. I have about 4,000 hours on my HID setup and I'm on my third pair of bulbs. Only LEDs worth money are JW speaker. But they don't make replacement headlights for your vehicle.. Other than that OEM LEDs are good. But PNP LEDs are just crap..
Save your money and do a HID retrofit if you want great output. Here are the Lumen -and more importantly - the MSCP numbers, straight from Sylvania, fer 9007 and 9008. Regardless of bulb premium and marketing, the numbers are the same across the board. Only life and kelvin changes. And the overcharge, lol. Sorry that you wasted $$$ that could have gone towards a retrofit. You can, with just a little effort and TRS's Value line of components, construct a set of HID projector heads for less than $200, all-in. Simply do not understand yer reticence - especially in the face of overwhelmingly solid recommendations and graphic evidence to avoid PnP Leds. I suspect you won't bend, hence I'll just leave it alone. Nothing further to contribute. I stand corrected. 1000lm/1300lm. Even still optics > brightness. You show up with a 3,000lm LED and give me 1,000lm and using optics alone I can get you better light coverage. I think you are witnessing a perfect example of what Stuart Chase meant when he said, "For those who believe, no proof is necessary. For those who don't believe, no proof is possible." To accept proof, we probably have to admit that we "don't know". This is difficult for many of us (me included, too often).